First up is soccer. Who would've thought that a 5-year-old soccer league would take up this much time. Practices, games, parades, pizza parties and more practices. A whole new group of soccer mom friends for me - hello Bria! - and team parent duties. This has taken a whole lot of our weekend time. It's been fun, but I continue to be amazed at how seriously organized sports for kindergartners is taken. The pip though, he LOVES being on a team. He's competitive, fierce and determined. He plays like a little uncoordinated chihuahua and we cheer him on the whole time. I love visiting different farms during the fall. We're always on the hunt for the 'perfect patch'. This year we've been to 3 and each one was so very different. Thankfully, Patrick loves it as much as I do and the boy just likes to explore. This was taken at the farm closest to our home. We pass it every day on the way to school, so it's tradition that we visit here first. I have a progression of pictures of Nico in front of this scary pumpkin thing from the time he was a little over a year old to today. I might have to sit down and scrap that soon. A little Boo at the Philadelphia Zoo this past weekend. So much fun to watch the little ones run around the zoo in their costumes. They are much more interested in watching for cool costumes than in the animals I think. Nico loved this although he was disappointed that I made him wear last year's costume. We weren't taking any chances with this year's costume - I just hope that thing makes it through the parades and parties this weekend! And so that's it - what I've been busy with. Well that, and assignments. So very many design team assignments. Sigh. I love it because they push me to be more creative and still meet deadlines. But I miss being able to post my work. I have to get back to that this week! This 2-page spread covers all of the highlights of our trip. I'll do individual pages about certain stories I want to tell (the pirate cruise, the beach house details, etc.) but I always like to do an intro page. Click on the photo above for a more detailed look. Did you ever go on a vacation and everything just seemed "off." This was one of those trips. It began with me spending the night before the trip in the ER and ended with a hurricane skirting nearby. I kept the journaling real and documented that too. I always focus on the good in life, but sometimes I wonder how seemingly 'perfect' our lives come across in scrapbooks. And so I added the warts in this story because I want to remember that too. I used the Seaside line pretty much exclusively and added a little kraft paper. I haven't used an eyelet in years and it was great to do some old-fashioned hammering. I placed most of the title right in the photo and made the flag myself. A little banner at the top with some clear Dew Drops in between and there you have it - one shore vacation layout. Good Friday morning everyone! Today I'd like to share a sneak peek of a project that I made for the Cricut Circle blog. It's a paper flower pomander and I made it with the Cuttlebug Daisy and Chrysanthemum Quilling kits. These kits make it a snap to quill. 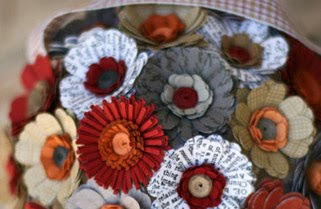 It's so much easier than the "old-fashioned" type of quilling with strips of paper. Promise! If you scroll down on the blog post today, you'll see my project and directions. Take a peek soon because the blog is closing and will be for members only. I'll be back Monday with a new October Afternoon 2-pager. I'm putting the finishing touches on it today! We've been invited to an adult Halloween party and I'm so excited! We haven't been to one in years and I can't wait to go. So I've been thinking of couple costumes and I came up with this little beauty right here on the left. Twilight's Edward & Bella. I think it would be so funny. We could be the old, grown-up, frumpy version. We could do the white makeup, a little old lady sweater for me, I already have the hair, a leather wristband & bouffant for Patrick and I could even carry around an apple just like the book cover. Perfect no? So I casually suggested this idea to my husband tonight and I got the death stare, unblinking "you must be out your mind woman" look. So then I asked if he would at least like to be a vampire, because I would like that. And he started muttering in Italian and walked away. I'll take that as a 'no'. I think he's getting jealous of RPattz. Ha! I'm at a loss now. I want something current and comfortable and cute. I think I want to go the route of "famous couple", but I'm stumped. Any suggestions out there in blogland? Come on folks, help a girl out! When I bought most of the Basic Grey Wander line I fully intended to do a bunch of New York City pages. We recently took Nico to Central Park and the Museum of Natural History. Perfect for this right? And yet every time I sit down to work with it, no travel pages come out. *This layout was created with the October Work in Progress kit. I love these huge bold letter stickers from the line. I placed them directly in the white space of the photo to add movement to the page. Add another squiggly road and some chipboard and it's all done. Love that Basic Grey. Thanks for visiting! I'll be back soon with some pumpkin patch pictures...(say that 3times fast) Ha! I just adore you Blog!!!! Congrats!!! How exciting! !I have wanted a Gypsy for soooo long...What a great giveaway!! !Thank you!!! Congratulations!!! I love the new CC blog!! I am a new follower of your blog also!! Thanks!! Well that was fun! Thank you everyone for entering. Winners, please email me (click on the 'contact me button' on the right) with your name and address please. I'm so happy for you! Thanks for playing along everyone. I really like this whole giving stuff away, you'll probably see more of it in the very near future! It's your last chance to enter for the big GYPSY giveaway! If you haven't already, please scroll down and leave a comment for a chance to win. I'm so excited to be giving away 2 Gypsies to my blog readers! Look for the winners to be announced here on Saturday morning. And I just wanted to take a moment to say 'thank you'. For all of your comments, emails and well wishes. I appreciate every single one of them. I've been given an amazing opportunity to work for Cricut and I'm grateful. I look forward to meeting, inspiring and learning from all of my Circlets (and non-Circlets too :). I'll see you in the morning. Good Luck! If I hear, "cause tonight's gonna be a good good night" one more time my little head is going to pop off. Seriously, he never ever tires of it. He has taken over my iPod and will play his beloved Black Eyed Peas songs over and over. Sometimes its Boom Boom Pow, but the one song he favors the most is I Gotta Feeling - you should hear him sing it a capella. Ha! And so naturally I had to put it all down on paper before he moves on to something else. The photos are totally staged to tell the story. I bribed him with my iPod and he gave me some of his signature rock star moves. Love that I caught him in 'action'. I wonder how much longer he will perform for me like this before it becomes too embarassing. All of the paper is from Imaginisce. I love the colors and chipboard. I made the record to ground my title and added studs and a little sewing for definition. That one large circle got me thinking and so I added a row of circles to continue the pattern. The last touch is the row of star stickers by Jenni Bowlin Designs and I stuck them right onto the photo to highlight the iPod. This was a fun layout to make. It took me a while to figure out the design, but once I decided on the circles, everything else fell into place. Thanks for taking a peek at my little rock star! While on vacation this past summer in Ocean City, we came across this Speedworld racetrack where the entire family could race. I can't tell you how much fun Pat and Nico had going around and around on those tracks. It was sweltering hot, there wasn't much pretty scenery and the smell of exhaust was in the air and yet THIS - this was one of their favorite memories from our vacation. Seriously? This must be a BOY thing. And that led to this page. The identical look of determination on both of their faces and the happy thumbs up make me smile. Sometimes these two are as different in personality as you can get, but in this photo you can see the car love they share. My favorite part of this layout is the squiggly road sticker and this cool laser cut paper. The entire layout was built around the story (naturally) and the use of these two items. And in case you were wondering, I rode too. But I was slow and not quite as competitive so I came in dead last. I guess you can say that scrapbook love is more my speed! I have been holding on to this picture of Nico with the ghouls at Disney's Haunted Mansion for over a year. I was looking for the perfect frame, but nothing really fit the look that I wanted. Then I stumbled on the Happy Hauntings Cricut cartridge and found just what I was looking for! I rarely do one large picture on a scrapbook page, but this story called for it. Plus, it was the only one I had. Getting a picture with the ghouls is very rare and we just stumbled upon a group of them just as we were getting off the ride during Mickey's Not So Scary Halloween Party. The look on Nico's face is priceless. He would not take his eyes off the ghoul for a single minute. He gave me the fake cheese grin, but no way was he going to give me a glance. I laugh every time I look at this picture. I wanted to emphasize the haunted mansion feel, so I made several Cricut cuts (frame in dark grey from the Mini Monsters cart & the gate from Happy Hauntings) in dark grey and black velvet. I layered them until I was happy with the look. I added studs, sponged on some black ink for definition and cut up some webs and spiders (Mini Monsters) to add to my piece. All of the paper is Jillibean Soup. I love how it adds whimsy to the page and ties in to Nico's "look". I was lucky that it had green in it and matches the picture. I hope you enjoyed my very first Cricut Circle page. I have a few more projects planned for this month that I hope you enjoy. While they will only be seen by Cricut Circle members on the private blog, I'm sure that you will see the influence of the Cricut on my personal pages right here as well! Well folks, it's official - I am proud, thrilled and excited to announce that I have been asked to join the Provo Craft Cricut Circle Design Team! Today we will be launching the premiere of the Cricut Circle blog. Join us all day long as Jana Eubank (our team leader) hosts awesome giveaways, challenges and introduces each member of the design team on the hour. I've seen all of the projects the team has created and they are AWESOME! I am very fortunate to be working alongside such a creative group of paper crafters. The Cricut Circle is Provo Craft’s affinity program. Provo Craft launched the Cricut Circle on July 1, 2010. The Circle is a place to Inspire, Educate and Create. This program enables crafters to see Provo Craft products first, be involved in specialized focus groups and surveys, receive special pre-launch specials on select Provo Craft products, a private blog and message board for Circletes to foster a special crafting community. Additionally, Cricut Circle members will enjoy 4 exclusive cartridges—one each quarter, instructional webinars and double reward points for purchases on Cricut.com. The Cricut Circle is available for annual or quarterly installments. To purchase a membership to the Cricut Circle visit cricut.com. Annual memberships are $274.99 and quarterly memberships at $79.99. Visit the blog at www.cricutcircleblog.org and let me know what you think. Leave a comment here on my blog and be entered to win a brand new GYPSY (actually I have TWO to give away - how cool is that)!!! You do not need to be a Circle member to be eligible - everyone is welcome to participate! I will leave the comments open until midnight EST on October 8th and TWO winners will be drawn and announced on October 9th. Good luck!